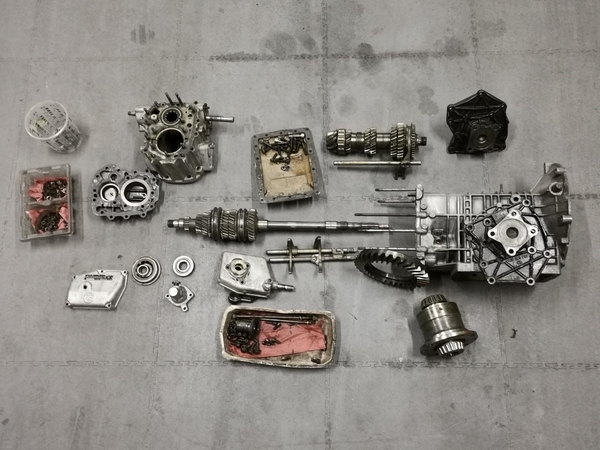 ZF 5 DS-25-2 gearbox out of our Pantera. Already dismantled. What you see is what you get. In good condition except input shaft. Thanks but a bit low. Perfect serviced ones sell for around 15-17 KEUR here in Europe. I would see ours closer to 10K than 5K. But we are opened to discussion. Rik, As attached to it as you may be, you can get one here in the US that is all together and good operational condition for $7-8K and ship it over. A disassembled collection of parts is $5K tops IMO. Anyway we will listen to any sensible offer. Rik, what is wrong with the input shaft? Gears also damaged? Photo s ìl vous plait? Eric, can you give us details how the gearbox got damaged? It takes a lot of torque to damage first gear and the shaft. The bearings have been shock-loaded and will need replacing. Is the casing still straight? I would encourage you to post detailed photos of the damaged parts so as to give members a better understanding of what they are getting. I must be one of the DREAMERS since I inquired about the 10.5 box. To spell out the possible problems---how many miles on it? How was it driven? How long has it been stored? Where was it stored? What climate was it stored in? Was it stored sitting up right or on the bottom cover? How much gear lube is in it? Is the gear lube original? Was the bottom cover ever removed to inspect the ring gear for any rust? Was it ever pressure washed? Now if the synchro clearances are low, the gear cones wear out as fast as the synchros on the type 2 so depending upon the clearances, the cone and synchro on every bad gear will need replaced and the only way to check this is to disassemble the box. It will shift fine with only .005 synchro clearance but obviously not for long. There are many other things inside a used trans-axle that can be listed but I think you all get the point. 10.5 is not out of range for a totally checked and documented or properly rebuilt pre 10,000 case type 2. It may be fine as is BUT if not??? Now a basket case with a bad input shaft for 10K plus shipping to the US would not be a cigar lighting deal IMHO. I do hope you both get what you are asking and the buyers get what they need and expect, good luck with your sales. The discussion on what is the right price or not is tricky. Buyers will always find it too expensive while sellers always thought it would be worth more. To be clear, I repeat that I am opened to offers, 4000 EUR was definitely too low and I won’t sell for that price. I can send detailed pictures on request. The story is quite simple. The gearbox was in our Pantera 2263/8263. It was working fine as a street car with this box. When we restored the car back to group 4 specs we realized that the ratios in there were not the ones we wanted. We had then the opportunity to purchase a fully rebuilt ZF with the correct ratios (for much more than 10K For your reference). We thought we would keep the old one as a spare but it does not make sense as we don’t race 2263/8263 extensively. We kept the box dismantled so that potential buyers see what’s the condition inside. Cannot be more clear. Then how some parts got worn, why, etc ... I don’t have more info than what I reported here above. Please do not misunderstand my post and you are right price is based both party needs. My post was primarily to address the other seller's DREAMERS note since I did contact him sometime ago so maybe I'm a dreamer to. He's posted several time on your thread---maybe since he is a 60s racer and has the best Road Runner in the world details are not required about his transaxle. To me, I have the best grandson in the world so maybe I'll try that the next I need to buy some thing---Better price for me? Again, in your case the advantage is you can measure synchro clearances, thrust washers clearances, gear condition, ring and pinion wear, and any damage. I am sure there are real buyers out there just needing more info about this transaxle. Kirk I am not the owner of that pile of parts displayed on the floor. This is my ZF!